The ten tree sculptures located north of the west tower of Bankers Hall, on Stephen Avenue, are a gift from Trizec Hahn Office Properties to the City of Calgary, made in 2000 following the completion of the second Bankers Hall office building. 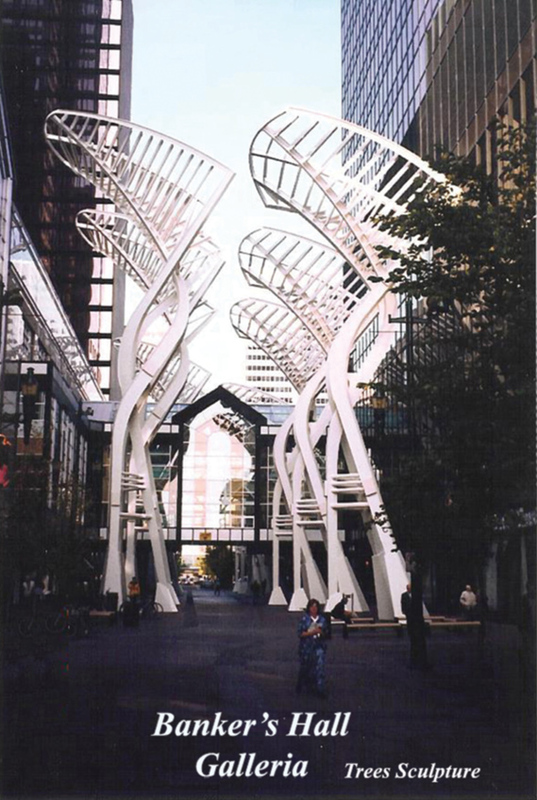 Since it is difficult to grow trees in Calgary, it was decided that the ten sculptures comprised of two design types would take the form of stylized trees as conceived by the Architect. One sculpture type rises to a height of twenty-six metres above its base, and the second type rises to a height of twenty-one metres above its base. The base pedestals are supported on and anchored to 1500 mm deep reinforced concrete caisson caps. Nine of the caisson caps are supported on three 750 mm diameter reinforced concrete caissons, and one caisson cap is supported on four 750 mm diameter reinforced concrete caissons, arranged to avoid below street utility lines. All of the caissons extend down 19.5 metres below the surface of Stephen Avenue to resist an uplift force of 800 kilonewtons (180,000 pounds). Type C1 concrete is employed in the caissons and caisson caps with a 28 days specified strength of 35 megapascals. In both design types, the trunk elements are two rectangular box sections and one triangular box section, all of which taper to a smaller cross section as the leg like elements rise to the tops of the trees. Approximately at the mid height of each sculpture type, the triangular box leg is divided into two rectangular box legs which continue to taper as they rise higher in the trees. Both design types have four levels of horizontal bracing incorporated into the designs, and all of the box leg sections have internal 10 mm thick stiffener plates at 750 mm centers welded to the inside of the box section plates, which presented a significant challenge to the Fabricator. The leaf elements are 300 mm deep by 121 mm wide channel like sections cold formed from 10 gauge steel plate. All of the structural steel conforms to CSA G40.20/G40.21 grade 350W. Welding conforms to CSA W49, with all exposed welds being ground smooth to the Architect’s satisfaction. At the time of structural design, a finite element analysis program was not readily available, therefore, at 300 mm vertical intervals, cross sections of the elements of the structure were modelled employing the Soda program to structurally analyse the sculpture, so as to design the appropriate wall thickness of the box sections and determine deflections and deformations. After the first prototype, of the taller sculpture, was fabricated by Empire Iron Works, they erected it in their work yard and load tested the structure with forces being applied as directed by Jablonsky, Ast And Partners. The measured deflections and deformation were identical to those predicted by the computer model analysis.